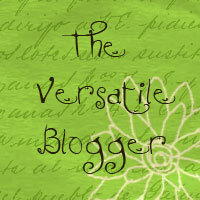 The Versatile Blogger Award -Thank You Lisa!!! I’m going to start with a big huge thanks to Lisa over at Memories in the Making for being my first guest blogger!!! I just LOVE her site, and I know you will too if (when) ya check it out! Lisa is so very talented and so sweet! As soon as her button is up, I’ll get it on our list! This one comes with a nifty set of rules, so here goes! I was inspired by the first blog I found (Everyday Cricut). The ladies there are really great at what they do, and there are so many projects they do that I just HAD to do. So, thanks to their inspiration, I decided to start my own blog. One thing I found issue with on various sites was that I didn’t have the resources in my scrap collection to do some of the projects, so I wanted to create a blog that used stuff I had laying around the house so that anyone could do them. So, here we are!!! 2. What kinds of blogs do you follow? Crafts, DIY, scrapbook…. I like to randomly find new ones, typically off of links I find on sites I already like. 4. Favorite clothing brand? The only reason I know there are so many brands is because I do have to buy clothes. Needless to say, no favorite brand! 5. Indispensable makeup product? Does chapstick count??? I LOVE CHAPSTICK!!! Pretty certain I have at least 20 tubes lost in various places around my house, van, and my husband’s truck! 6. Favorite color? ORANGE!!! I can’t get enough of it! I read somewhere that the color orange makes people happier (I’m a psychology fanatic and have my B.A. in it). 9. What country would you like to visit and why? Good One…. Ummm… I would love to visit any tropical island paradise. I love exploring cultures, and beaches are just gorgeous!!! Thanks to all the wonderful inspiration y’all provide! Keep up the awesome work!!! Thank you so much for the award and the kind words. I really appreciate it! Congratulations on your award too. Looks like you are off to a good start with your new blog!